Description: 576 is just leaving Tower A with WF-2. Description: Maine Central Railroad EMD GP7's No. 575 and No. 576 are providing power. 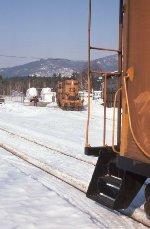 Title: Maine Central Railroad EMD GP7's No. 575 and No. 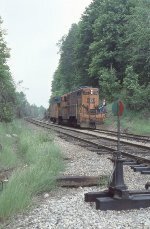 576 lead Northbound Mixed Freight "WX-1"
Title: Bucksport Local backing towards Calais Jct. Description: Theyre not all dead, some are waiting for shop time. Still, its quite a gallery, with everything from 40 year old GP 7s to six axle GEs. Only in Binghamton. 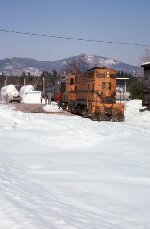 Description: Beautiful color combo of northeastern road switchers at Eastside Yard of all places.